The Dornier Do R Superwal was a German flying boat airliner of the 1920s. The Do R was a larger development of the Do J, with a larger high-mounted strut-braced monoplane wing and longer fuselage. All but the first three built also had four engines in place of the Do J's two. The Do R could carry 19 passengers in two cabins; 11 in the forward cabin and eight in the rear. The first R 2 Superwal D-1115 made its maiden flight on 30. September 1926 Two 650-HP-Rolls-Royce Condor-III-engines were mounted in tandem in a nacelle above the wing and in line with the hull; one engine drove a tractor propeller and the other drove a pusher propeller. D-1115 was the big flying boat that could be built in the Dornier factory in Manzell after the war. The Superwal went into service with Severa and later DVS in List, both organisations of the German government to develop military Seaplanes ignoring restrictions of the Versailles treaty. 1927 built two more R 2 Superwale for Severa. D-1255 was sometimes used by Lufthansa and named Narwal and D-1385 with 800-HP-Packard-engines, which served until November 1936. 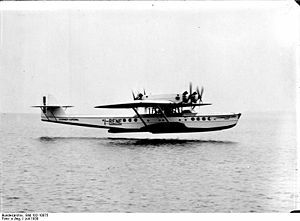 Between 20 January and 5 February the Dornier Chief Pilot Richard Wagner established twelve world records for seaplanes with a new R4 Gas uperwal. This aircraft and eleven more with Gnome et Rhx�ne Bristol-Jupiter-engines(R4 Gas) or 525-HP-Siemens-Bristol-Jupiter-engines (R4 Sas) came 1928/29 to Societx� Anonima Navigazione Aerea (SANA) and Lufthansa. Apart from their use by Lufthansa, six Superwals saw regular service with Italian airline SANA into the early 1930s along the Italian west-coast and to Spain. Three aircraft were lost. The Superwal I-RUDO went into the service of the Italian Airministry in 1934 and became the last Superwal in Italian service. It had Isotta-Fraschini-Asso-500-engines. At least one machine actually was assembled in Spain by CASA. World Aircraft Information Files. London: Bright Star Publishing. pp. File 892 Sheet 27. "Berlin Aero Show 1928". Flight: 908-09. 18 October 1928. http://www.flightglobal.com/PDFArchive/View/1928/1928%20-%200977.html. Retrieved 2008-02-28. "The New Dornier Super-Wal". Flight: 18. 12 January 1928. http://www.flightglobal.com/PDFArchive/View/1928/1928%20-%200018.html. Retrieved 2008-02-28. "The Dornier Super-Wal". Flight: 817. 9 December 1926. http://www.flightglobal.com/PDFArchive/View/1926/1926%20-%200961.html. Retrieved 2008-02-28. "A New Dornier Super-Wal". Flight: 199. 22 March 1928. http://www.flightglobal.com/PDFArchive/View/1928/1928%20-%200219.html. Retrieved 2008-02-28.